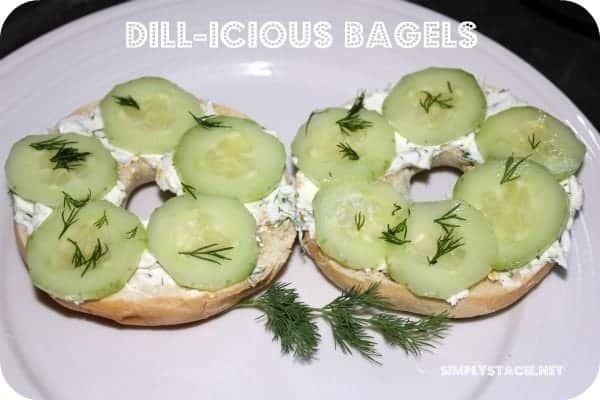 I recently wrote a post for UrbanMoms and shared a recipe for Dill-icious Bagels created by Food Network Chef Bob Blumer. Well, it looked so good that I wanted to give it a try for myself! It’s a keeper and so darn easy. It gives regular plain cream cheese a little more flavour. 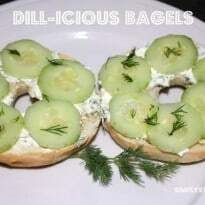 All you need are cream cheese, cucumber, fresh dill, orange, salt, pepper and of course, bagels! The first thing to do is to slice half a cucumber into very thin slices. Put the slices in a bowl and add salt. Then you mix it up with your hands until the cucumber releases water (about 1 minute). The next thing to do is make the cream cheese mixture. 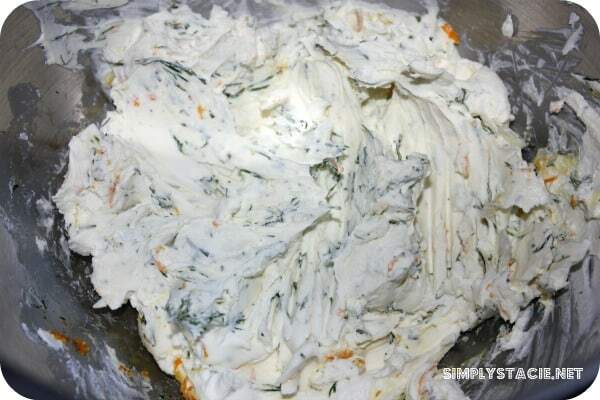 Combine cream cheese, chopped fresh dill, orange zest and pepper together with a fork. 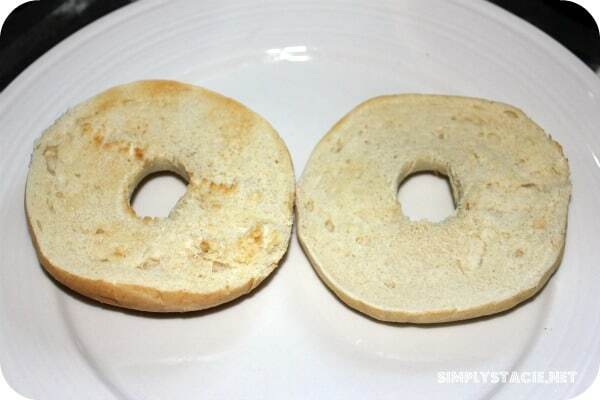 Toast your bagels the way you like them. 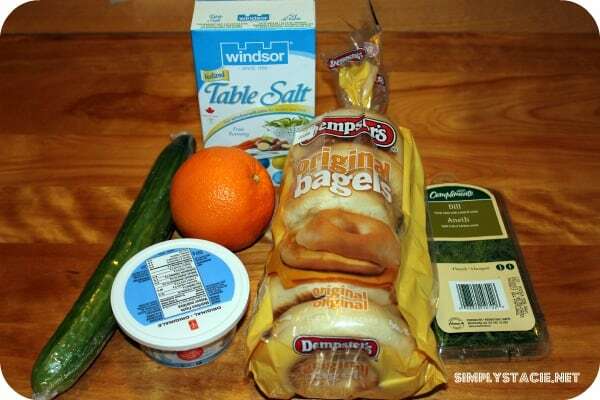 Spread the cream cheese mixture onto the toasted bagel. Place cucumbers on top of the cream cheese and serve. Yum! 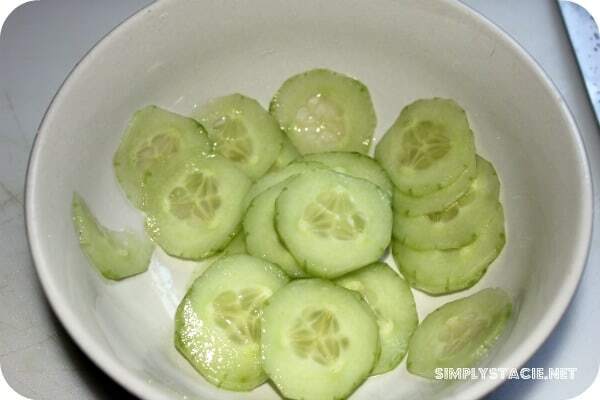 Peel and cut cuke into super-thin slices. Transfer to a small bowl and sprinkle with salt. Toss continuously for 1 minute or until slices start to release water (the brine). Let sit for a minimum of 5 minutes, then serve immediately or refrigerate. In a medium bowl, use a fork to blend crème cheese, dill, zest and pepper. Reserve. To serve: Toast, and if you choose, lightly butter bagel. Top with cream cheese and cucumber slices. Garnish with dill. Remaining spread and pickles will last in the fridge for 5 days in tightly sealed containers. Yield: 1 serving + enough spread and pickles for 3 additional servings. I love the English Cucumber, less seeds! That looks really nummy, love dill! These sound good… anything with cream cheese is delish!! These look good! I love dill on anything! I love these. They look delicious. 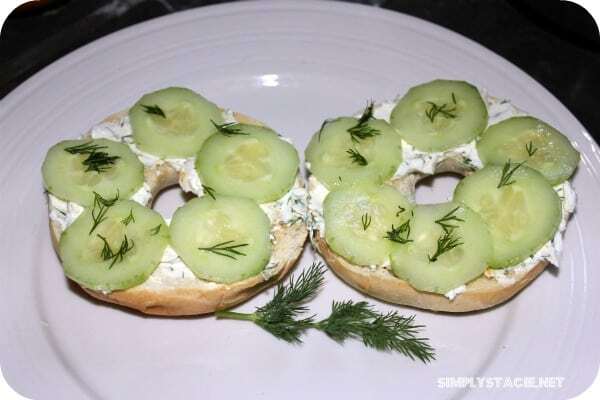 Cucumbers dill and cream cheese are so yummy together.